End of the year approach means a lot of sweet treats, festivity and family reunion. Today I made a tasty tart, this recipe is inspired by Stefan Gourmet’s blog that I follow. I appreciate the detailed of his work and the large varieties of his recipes. Here, I opted for a prune purée (dried plum purée) instead of fig jam! Now let’s go to Angie from The Novice Gardener at the Fiesta Friday #98 and thanks to our co-host for this week Sadhna @ Herbs, Spices, and Traditions and Natalie @ Kitchen, uncorked. In a food processor, add the flour, the pinch of salt, the icing sugar, the soft butter and then one egg. Start to mix all the ingredients together until you assemble the dough. Slowly add the water and continue to mix, until it holds a ball. The dough now is ready. After 30 minutes remove the dough from the fridge. Cut the dough in 5 equals balls. With a rolling pin, flatten the first ball of dough the size of your tart pan. Poke the bottom of each crust. In a large bowl add the pitted prunes/dried plums. Cover with hot water and add one tea bag for 15 minutes. After 15 minutes remove the water. In a food processor add the dried plums and 50g of caster sugar. Mix a few seconds just to obtain a thick texture (not perfect and smooth texture) and set aside. In a medium bowl add the butter and the sugar. Start to mix until the texture becomes creamy. Add the first egg and continue to mix. Add the second egg and mix until all the ingredients are well combined together. Finally, pour the almond powder and the flour. Mix very well until the mixture is consistent and set aside. 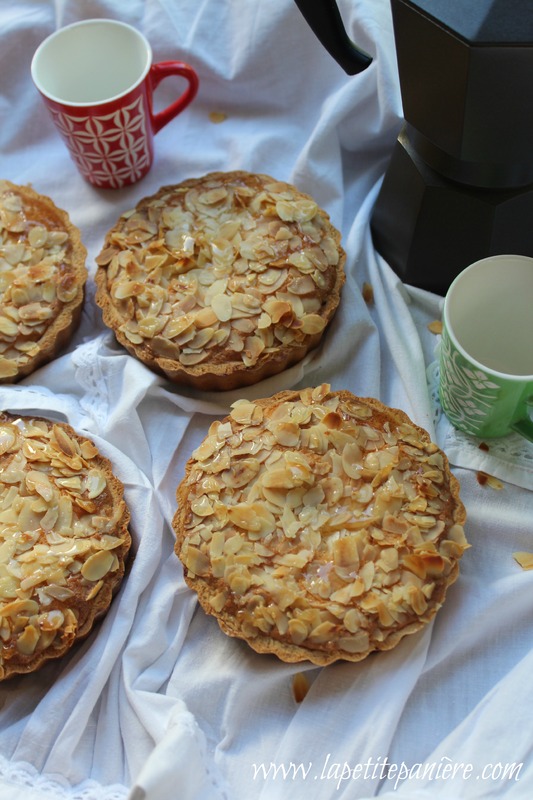 Pour the prune purée into each tart (equally) and pour the almond cream on the top of each tart. Sprinkle with some almond slices. Bake for 45 minutes (more or less depending on the oven) or when the crust is golden brown. Remove from the oven and allow to cool for 30 minutes. Brush with a little of warm honey on the top if you want. The tart is really delicious! Beautiful in style, flavour and texture, as always my friend. 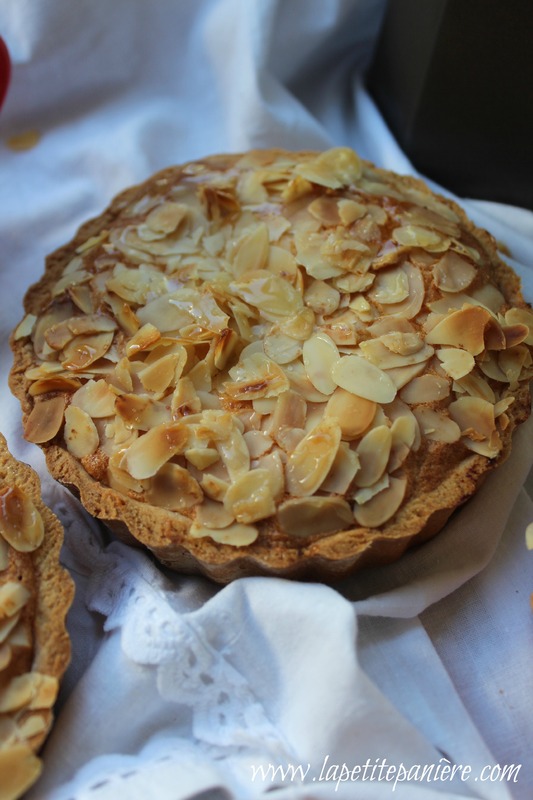 I’m always keen for a little fruity, frangipane tart! Wow Linda! You are a super star! You bake with such precision and patience that it’s really awesome! Hi Linda, your tarts look absolutely wonderful! Thanks for the shout out. Funny that you made them with prunes, because that is what the original was made with. I’ll have to make the tart with prunes, too. I know my mother would love that. So beautiful and delicious, Linda! Thanks a lot Amanda for your kind comment and I’m glad you like the recipe! 🙂 Have a nice Friday! It’s perfectly beautiful — and looks delicious! Hugs.